According to the United States Department of Agriculture, chicken is safely thawed by only three ways: in the microwave, in cold water or in the refrigerator. 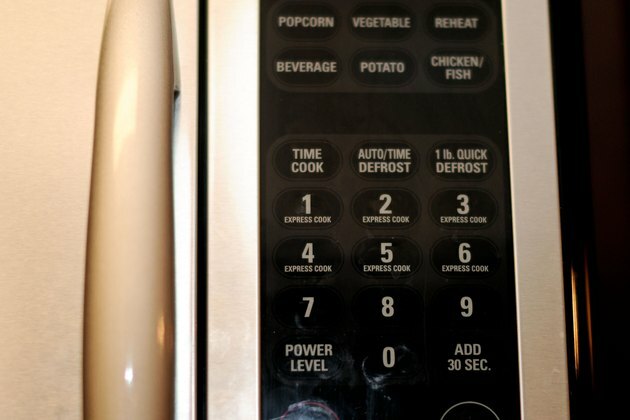 Of these, microwave thawing is the quickest method. Consider the various methods carefully and plan ahead, as each has distinct advantages and disadvantages. 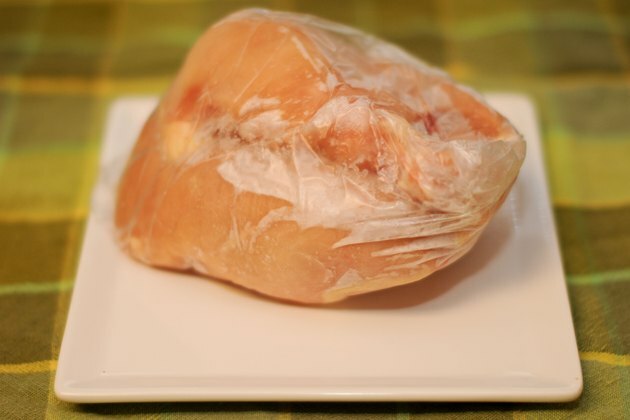 Thawing chicken properly is critical, as the chicken must be kept at a safe temperature during the thawing process. 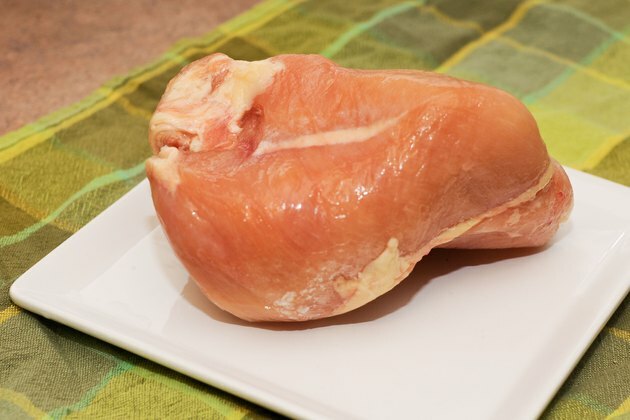 Improperly thawed chicken may cause serious food-borne illness. Unwrap the chicken from its packaging before thawing it in the microwave, as plastic, Styrofoam and other packaging materials may affect the flavor and quality of the chicken. Certain plastics are unsafe and may melt. Place the chicken on a microwave-safe tray or plate. Thaw the chicken according to the recommendations in your microwave oven's manual. Thawing time depends on the size and power of your microwave and the size of the chicken you are thawing. 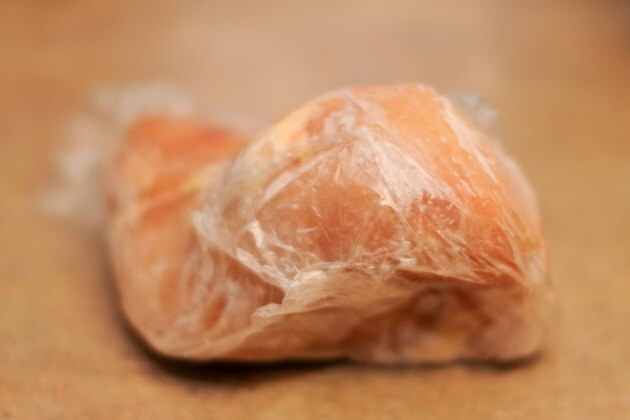 For example, chicken thighs or breasts thaw faster than a whole chicken. Set your timer accordingly and don't leave thawed chicken sitting in the microwave. Cook microwave-thawed chicken immediately, as the chicken often begins to cook during the process of thawing. 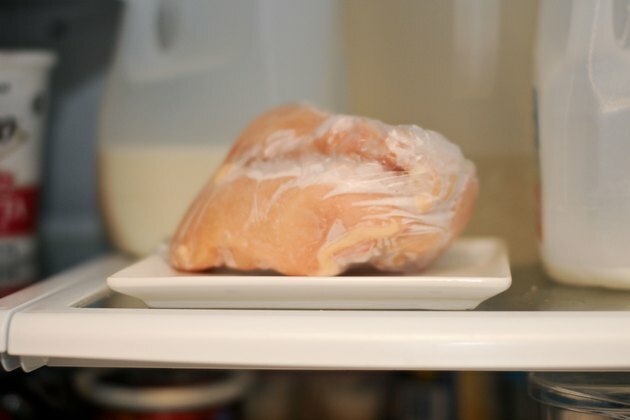 Don't refreeze chicken after thawing in the microwave unless you cook it first. Thaw chicken in cold water if you prefer not to thaw the chicken in your microwave. 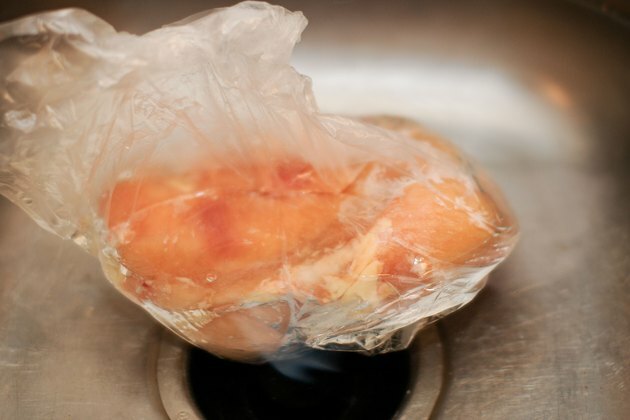 Other than microwave-thawing, cold water is the quickest way to thaw chicken. Leave the chicken in its original airtight packaging. Alternatively, remove the chicken from its store packaging and place it in an airtight plastic bag. Fill your sink or a large basin with cold water and place the chicken into it. 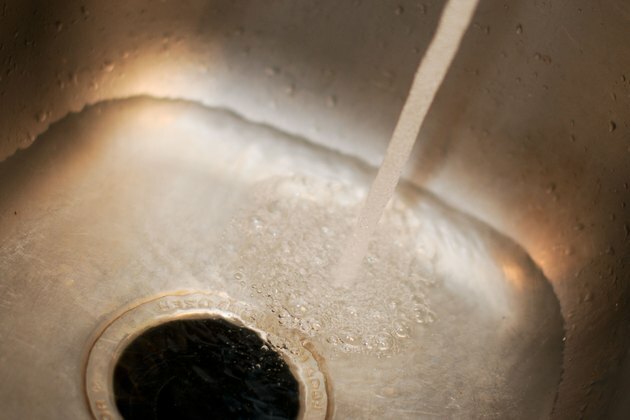 Empty the water every 30 minutes and refill the sink or basin with fresh, cold water. Leave the chicken in the cold water until it is thawed. Allow two to three hours for a whole chicken weighing approximately 3 to 4 lbs. and approximately one hour per pound for chicken parts, such as breasts or wings. Do not refreeze chicken thawed in cold water. 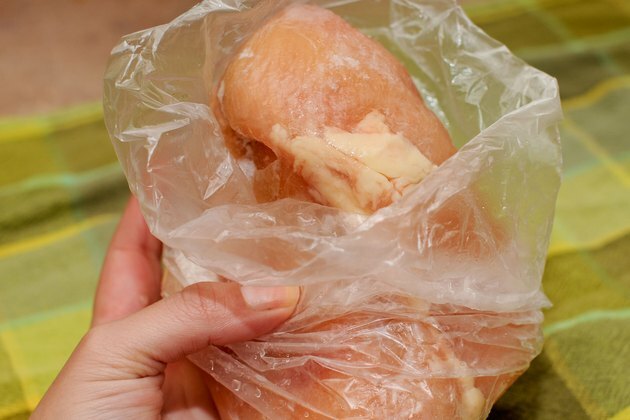 Plan ahead if you choose to thaw chicken in the refrigerator. 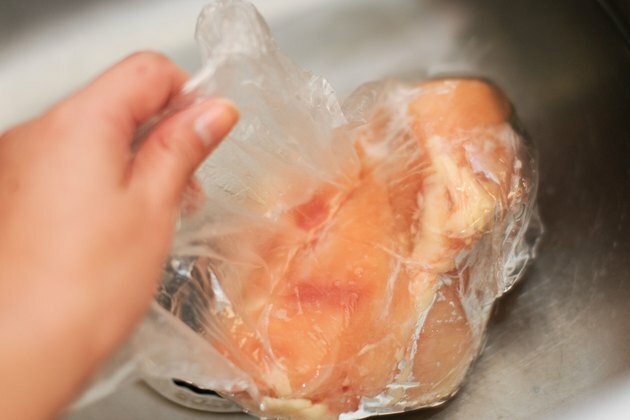 While thawing chicken in the refrigerator is safe, it is the slowest method. Allow a full day of thawing time for every 5 lbs. Place the chicken on a tray. 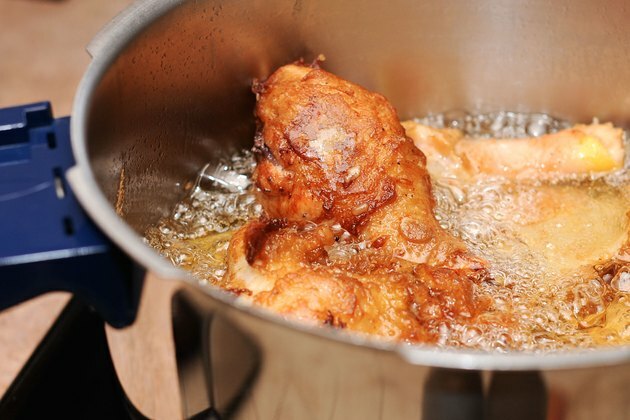 As the chicken thaws, it will drip, and the drippings may contaminate other foods. 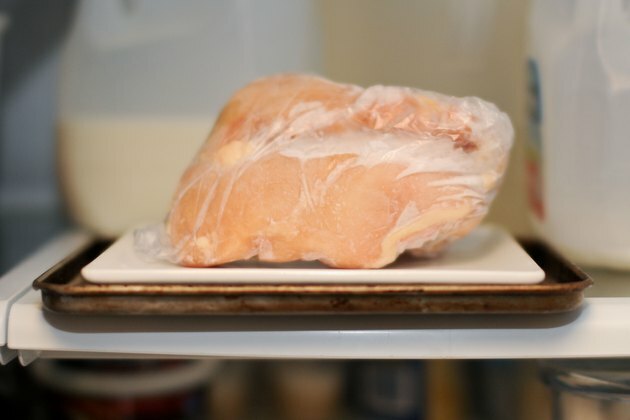 The chicken can be safely left in the store packaging during refrigerator thawing. Use the chicken within two days. Chicken thawed in the refrigerator is safe to refreeze. Prevent contamination by cleaning and sanitizing your work surface and tools after thawing or working with chicken to prevent contamination. Wash dishes, tools and your counter tops with hot, soapy water, then follow up with a mixture of 1 tsp. household bleach combined with 1 quart water. Wash your hands with hot, soapy water.